The latest U.S. government data from 2007 showed that fifteen workers each day lose their lives from work-related injuries, and four workers each minute suffer work-related injuries. No one wants to think about someone at their workplace being injured or suffering a health crisis. The unfortunate truth, however, is that statistically, odds are in favor of it happening. If it does, wouldn't you want to have the knowledge and training to help a coworker in need? All HEARTQUEST instructors are AHA and ECSI and follow ILCOR guidelines, as well as operate under the latest American Heart Association guidelines. Specialized training in First Aid, CPR, and AED. First aid kit sales and supplies. 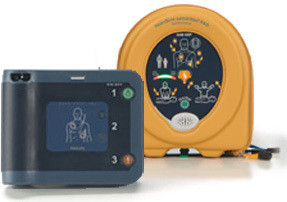 Phillips and HeartSine AED Sales. Safety is serious business, but that doesn’t mean safety training must be dry and boring. HEARTQUEST instructors use “real life training” and an interesting, fun approach to safety so students remain engaged, and retain the important information they learn. Learn more about our services and the products we supply to make your workplace the safest environment it can be.